An optimized ‘Find a Provider’ tool is critically important to both the patient’s customer experience (CX) and a healthcare organization’s bottom line. While a significant investment, a provider search tool can improve the patient’s experience via better patient-provider matches. This helps drive down the cost of delivering care, increases access to care, and enhances market growth. 1. A patient’s context of care determines what provider data they need. Patients will prioritize what’s most important to them according to the type of care they need. For example, a mom-to-be looking for an OB/GYN may want a nearby practice given the number of prenatal appointments. However, when choosing a pediatrician, the same mom-to-be may place higher value on same-day appointments and after hours availability than on practice location. A person diagnosed with Crohn’s Disease might focus on in-network providers with significant treatment experience while someone who needs stitches just wants the closest urgent care with the shortest wait times regardless of network. Simply put, a patient’s values change based on primary care, specialty, or urgent care needs. A truly CX-focused Find a Provider tool must deliver a provider-patient match that satisfies each patient’s unique search criteria and what they value at the moment. 2. Provider profiles should satisfy a patient’s emotional needs too. Too often, provider search results show just what’s absolutely necessary – credentials, certifications, and (most of the time) a headshot. These are important, however arguably more so to clinicians than to patients. Rather, patients often make decisions based on intangible qualities or purely on emotion: Does the doctor speak my language well? Does she seem understanding? 3. Global search integration ensures provider data is always accessible. Provider searches are often implemented separately from the organization’s global search. Meanwhile, patients typically don’t discern the difference between searches across a site. This means that provider searches from the global search box often yield no or less relevant provider results. A CX-focused provider search tool both displays provider profiles from the global search and provides a means to filter and sort by the most sought-after data points. 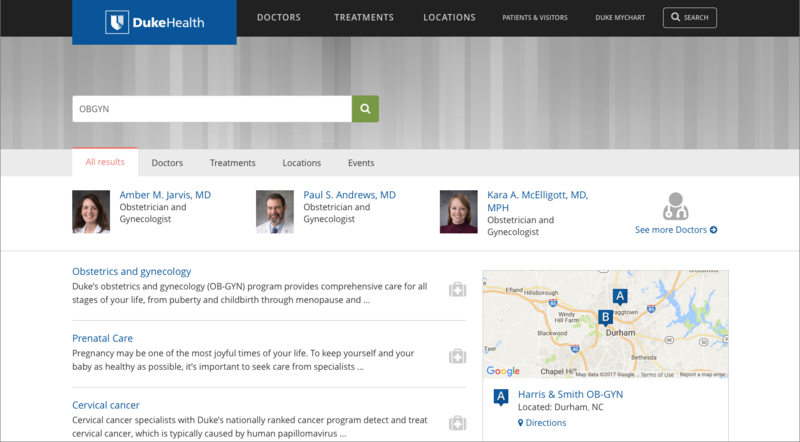 Duke Health’s global search integrates provider profiles into the overall search results and enables patients to easily filter using tabs. 4. Including provider information alongside services content helps patients connect the dots. Provider information should be made available alongside service line, treatment and conditions, and locations content. So, for example, when on a conditions page, the patient should have a clear and easy way of seeing specific physicians that treat that condition without the need to search. This creates a path for patients to select a provider and make an appointment. 1. Developing a source of truth for provider data is the first step. Ultimately, an organization’s provider search is only as good as the accuracy of its provider data. Organizations must maintain a reliable source of truth that pulls data from and provides data to credentialing systems, EHR systems, provider directories, health plans, and other third-party systems. Each healthcare organization must decide how to best collect and manage provider data and ensure it can be accessed by a provider search tool. In addition to a source of truth, a global taxonomy and business rules strategy is a must to ensure accurate provider information is delivered across both internal systems and external channels. 2. Provider profiles should be SEO-optimized. While the on-site provider search is important, we’ve observed in our research that most users initiate searches using a search engine like Google and rarely persist beyond 1-2 pages of search results. This means your provider profile pages are directly competing with profiles on Health Grades, Vitals, WebMD, and other popular health sites. 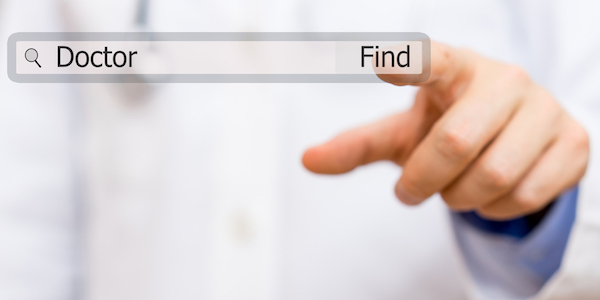 With search engine optimization (SEO) highly influencing what patients see, a provider search tool must integrate SEO-enabled technology, such as relevant schema.org structured data, to increase accessibility of provider profile pages both on and off the organization’s website. 3. Provider profiles should support and track meaningful conversions. Provider profiles must clearly indicate the next step for patients and referring physicians. How do they make an appointment or a referral? While this may seem like a no-brainer, too often the desired action an organization wants the patient to take isn’t obvious. Integrating with EHR systems, such as EPIC, enables organizations to combine provider search, a patient’s existing provider information, and their personal medical history into one view. The result? 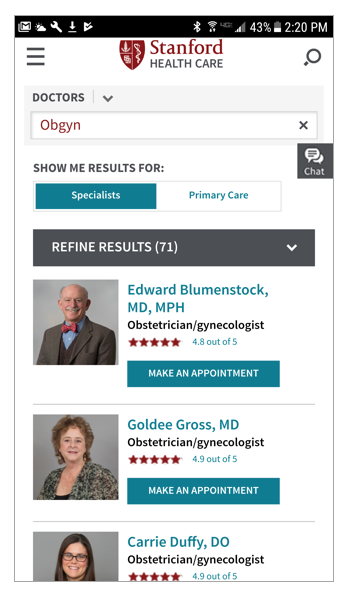 The potential to deliver more effective provider-matching based on patient preferences as well as seamless conversions like online scheduling. Tracking conversions can be challenging when they occur across different systems. Some third-party provider search solutions offer out-of-the-box measurement capabilities. Make an Appointment, they see the appropriate next steps for chosen provider. 4. Don’t overlook the organization’s user experience needs. The provider search tool should allow for management and workflow – ease of adding and removing content and the ability to set up an approval process. Allowing providers to enter their own content at the start of an approval chain would be valuable to many organizations. While other unique factors will certainly play into each organization’s consideration set, those noted above should give health system marketing and IT team a solid starting point for creating a functional needs assessment. Want to chat further? Let’s connect.